Reached lap 15 a day ago (currently on lap 15 node 4) , 2nd place is at the end of lap 13. @Ariel-Barzilay Ah ok. Then you buy the rest out. Now I understand. Not necessarily, usually after completing the breed and hatch I wait the remaining wait time for the longest task ( food or feed). sometimes I use the spin wheel at that time to minimize the remaining items of the longest task and shortening the longest pool time. 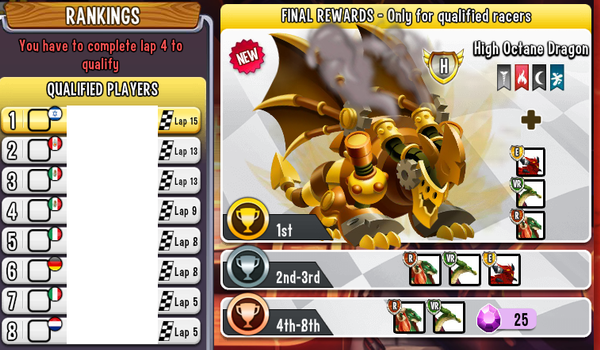 In general I try to avoid using gems since lap 10. @Ariel-Barzilay I am always doing gold, feed and food first because that has the longest waiting time. Hatching and breeding has shorter waiting times. So I am doing that when the waiting time for the other things already started. I think that is the way to save most time. I've just said that after collecting the pool size of all the tasks, sometimes I don't wait till the longest wait time is finished. if I have breed and hatch tasks (which always have shorter wait time than the others), sometimes I complete these tasks when their wait time is completed and don't wait till the longest wait time is finished. anybody know when if the pool time counter starts from the first item you recieve or if it starts from the last item? the 2:40 wait time seems to always take way longer than when I time it from the first item i receive. I believe it starts from the first but I always set my timer based on the last. Also, I do not log in per individual timers. I set my alarm based on the one with the longest time and do the full set of pools at once. It is too difficult to try to keep track of individual timers and pools. In the last laps it is easier to just log in 3 or 4 times a day. 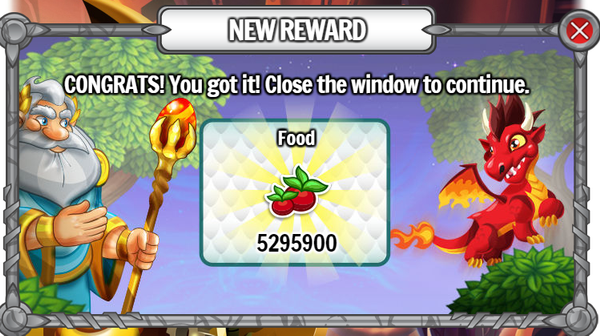 you're right to wait till the one with the longest time is finished, yet I'll recommend that in case you have a node with breed/hatch and food or feed (not gold) when the food/feed has the longest wait time, not to wait with the hatch/breed tasks till the feed/food time is finished but to finish them when their time is finished as they take some time to complete. For example in this race, for nodes 10-3 & 10-5 I use this strategy. Another bug I've encountered is that sometime when you have an egg in the hatchery and it's about to hatch (in its last 30 seconds when there is an option to watch a movie to hatch it) if you click on the hatchery when the hatch time is just about to end (~1 sec before) the game is stuck and only restart can fix it. I usually encounter this problem during heroic race as I breed and hatch many Terra dragons (~13 secs breed/hatch time) so as the duration is very small and I'm breeding & hatching in a row, the frequency I reproduce this issue is very high. My workaround is to wait till all the eggs hatch and then click on the hatchery to avoid it. Just FYI, bug was reported to SP and moved to the R&D team, they are familiar with this issue and trying to fix it. You're lucky to have such competitors, I've reached lap 12 node 1 and the 2nd and 3rd places are at the end of lap 10. It seems I'll need to make it all the way to lap 15. Let's say that the wait time is 30 mins (per each item) so you multiply it with 2 so the total time is 1 hour. So I use the previous race similar/matching tasks' pool times for calculation. And BTW , it's working.. so far..